'Hacienda', the Thomas Gerald Condon estate designed by H.T.E. 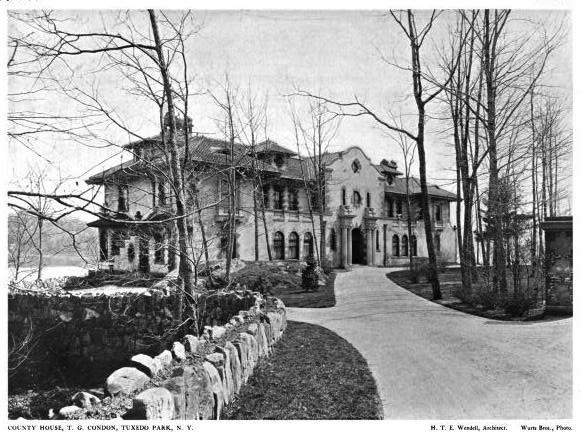 Wendell c. 1899 in Tuxedo Park, New York. Condon was president of the Southwestern Coal & Iron Company. The New York SHPO has a 1977 filing by the Orange County historian which credits the design to a William A. Bates. The estate was sold in 1908 to Pierre Lorillard Barbey and suffered a devastating fire in 1920. The residence was reconstructed by Robert R. Graham along the original design c. 1926. Click HERE to see 'Hacienda' on bing. Click HERE to see 'Andros Hills', Condon's Grosvenor Atterbury designed estate in Southampton. Love everything about this one. The siting is awesome. I always get confused with the style. Spanish? Flemish? Just followed the link to Andros Hill, and then followed twirled it around on Bing, which shows the renovations at different stages. The wonderful tower gone, replaced by a stiff octagonal affair, the landscape approach to the house stiffened up. People just can't leave well enough alone. I suppose the tower was just to radical.